Repair splits, cracks and small holes in plastic canoes, kayaks and other small boats made from HDPE, LDPE, ABS, PVC or polycarbonate plastic with the contents of this kit. 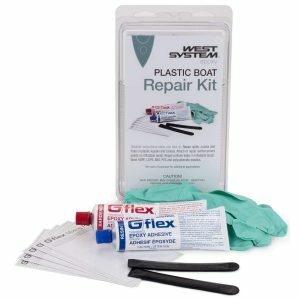 The Plastic Boat Repair Kit features plastic-friendly G/flex 655 Thickened Epoxy Adhesive, and is assembled with the do-it-yourselfer in mind. Each kit contains 8.4 ounces of pre-thickened G/flex epoxy, protective gloves, mixing pallets and reusable mixing sticks. Illustrated, detailed instructions explain how to repair splits and cracks in plastic boats, attach or repair reinforcement points on inflatable boats, and repair pinhole leaks in inflatables. All components are contained in a sturdy, resealable package. G/flex has been available since 2007. Enthusiasm for this toughened epoxy continues to run high within our company and in the field because of the unique properties that G/flex offers. This product has proven popular with canoe and kayak liveries repairing molded plastic boats, including normal wear and tear on the bottoms near the bow and stern as well as cracks and splits that occur in the hulls. Visit Epoxworks.com to learn more about Gluing Plastic with G/Flex Epoxy.